Stuff. That’s what I have, and not much of it. My burnt thumb is all better. No I did not spill the cookies when I burned my thumb, thankfully. I actually don’t enjoy baking at all. I do it but I don’t enjoy it. But that’s life, living with another person and two dogs. You do things you don’t enjoy anyway, just to be kind. And Paul loves to have cookies. He really hates store-bought cookies, too. He also hates store-bought ice cream, now that I’ve spoiled him by making it every week. It’s so simple with my ice cream making machine that I don’t really mind doing that job. As long as he buys the cream at the store, I can make the ice cream. What I have not done in a very long time is make dog cookies. Remember when I used to make those? On another topic, Paul’s “new” truck (it’s a 2012 Ford F-150) is starting to become a problem. The driver’s side door has been frozen locked now twice. Once right after he bought it and then again today. Luckily, he could get in on the passenger’s side because that door hadn’t frozen locked. But this is not good. I went and bought two different brands of battery operated lock de-icers and he tried both of them today – neither of them worked. He may not have let them warm up enough, I don’t know, but he said he got in on the passenger side. But now I’m thinking that this was pure luck. It’s only a matter of time before he comes out to two frozen locked doors and can’t get in his truck at all. I have researched this online and it’s a very common problem apparently. I don’t think there is a cure either. I told him he needs to go over to the Ford dealer and pose the question to him – what can be done? Can anything be done? This is not acceptable – living in New England and not being able to open your locked vehicle in the cold weather. New topic – Paul’s boat. Great! What if Hugh hadn’t gone out lobstering? He does have my cellphone with him, but he is very lax about charging it regularly, and I always worry that it won’t be charged up. He said if there were no Hugh, he would just wait for anyone. Anyone? Really? In New England, on the Atlantic Ocean, in mid-December? Who does he think is going to be moseying along? Santa? 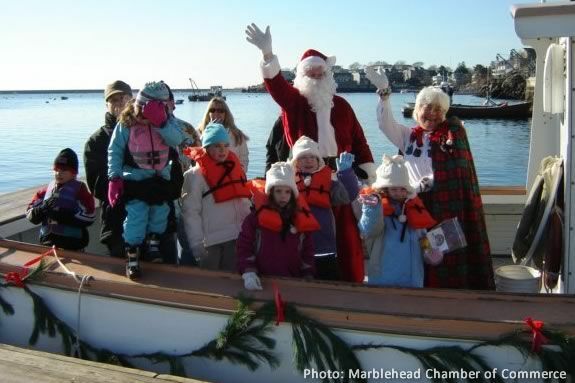 Actually, Santa and Mrs. Claus made their appearance at The Landing in Marblehead Harbor on Friday as start of the annual Christmas Walk. The woman who plays Mrs. Claus was in my class all through school. We met in kindergarten and graduated high school together. She used to wear a white wig for playing Mrs. Claus (the Clauses come by lobster boat into the Landing each year to a throng of the town’s parents and children). But now she uses her own shock of white hair and doesn’t need the wig! So the Christmas season has arrived here. Let the shopping begin. Enough from me. Keep on keeping on… if possible. No warm spot here either… just outside in the driveway. I read that the liquid spray stuff is not good… that it can clog up the works inside the lock and down into the door and then it can freeze up even worse. It’s that time of year for freezing problems. Last week, the tailgate of DH’s SUV frozen with the lock open! You could close the hatch and the latch would move but whatever would lock the latch into place didn’t lock. If you lifted the hatch it opened right up again. DH suggests that you get one of the liquid deicers for Paul’s truck door. He says the liquid spray ones work best. And once the lock is open then the best thing to do is put the vehicle somewhere warm so the water in the lock will dry out. We were lucky that it warmed up after a few days so our lock problem was solved, because we don’t have anywhere warm we can put our cars. No garage and no carport. Glad to hear Paul made it back home safe and sound! What a mellow man Paul must be, to trust the universe to bring him safe home to you. Love your new folk favourite! It’s a good thing that Hugh came along. That must be a creepy, bad feeling, having the boat die on you! Frozen door-locks are surely a pain! Would covering it with duct tape keep water from getting in, or is it condensation from inside the cab? Your cookies look quite tempting. Yumm! Dog cookies are a great idea. 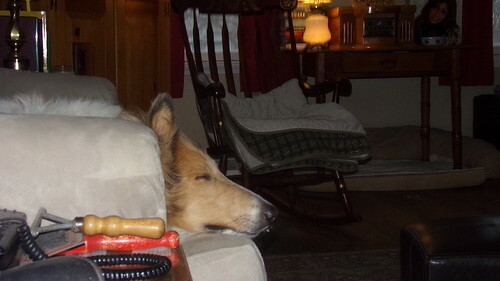 Bobo has recently discovered the joys of beef jerky! I have to get the dog-sized treats for him, though, as he tried to swallow the smaller “kitty strips” whole. With the larger size, he bats it around the living room and has to fish it out from under the couch before settling down to gnaw on it. I loved the post today and your photos. Homey. Paul is a lucky guy to have you to bake him his favorites. I do any baking except my turkey pot pie. Although Mr. F has said he would like it if I made him a fruit pie. Not so much for the fruit but for my crust. Glad to hear that someone came to Paul’s rescue out there on the sea. This would give me the heebee geebies. When I lived in Kansas, I had a vehicle that the locks would freeze up. I remember having to enter from the passenger side. That was a good idea for Paul to go to the dealership and tell them about the problem. Hopefully they have dealt with this before and can tell Paul what to do. Your puppers are so lucky to have you to make them cookies. I’ve tried three recipes for Bailey the Cat and none of them turned out right in that he sniffed them and then walked away. He’s so picky. I do like your new favorite singer, Gregory Alan Isakov. But then, I like folk singers and songs. 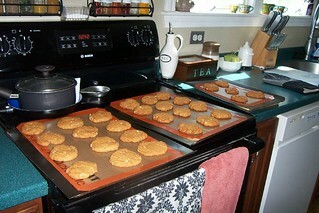 I’m not a big fan of baking cookies either, but I do like the finished product. This is the best time of year to do it. Cute pictures of Mr. and Mrs. Claus! Eric, he always takes cookies and fruit and his PB&J sandwich and his water bottle when he goes to work on the ocean. He’ll come home a lot of times with the apple not eaten, or the cookie, but never the PB&J. 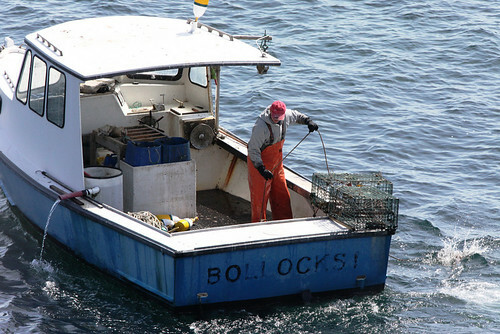 Man, Paul is pretty laid back about being stranded on the ocean! And in December no less. I suppose he’s used to being out there on the water but it’s amazing to me. Better make sure he has a supply of cookies next time he goes out. Be very careful and slow when you are outside helping to shovel… do not slip and fall please!! For someone that dont like to bake you do a top of the line baking…I sometimes can smell it all the way to Des Moines Ia. Lucky Paul to have you to fix his favorites…fuzzies also. WOW…glad someone came along to help him and boat…I hate to think of him alone out there just waiting for help . I do hope they can get his frozen door taken care of .